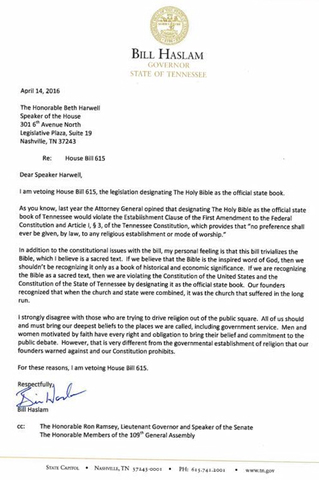 The Bible will not be the official book of the state of Tennessee. According to reports, Gov. Bill Haslam has vetoed the bill. The governor cited the attorney general's opinion that it would violate the First Amendment. He also added his personal feeling that making the Bible a state book would trivialize a sacred text.